Posted December 22nd, 2016 by Marcia & filed under Active Listening, Actively Engaged Workers, Career Development, Communication, DISC Personality Styles, Hiring & Selection. January is one of the busiest hiring months of the year. The beginning of a new fiscal year for many businesses, it inspires an influx of new positions that need filling. At the same time, January is a time for a lot of personal reflection as well, and it’s often when people look for a new career path. But even as you scan job listings and submit your applications, it’s important to consider: have you done everything you can to be the best candidate in a new career path? Here are our recommendations for increasing your chances of being hired for a new position! Even if you’re satisfied overall at your current job, there must be a reason why you’re contemplating a change. What needs do you have that you feel aren’t being met? Some serious assessment might be in order to help you find the right fit. Consider taking a test like the DISC assessment to learn more about your leadership styles, communication preferences, and personality. It may reveal what type of workplace culture will help you flourish and contribute your best work. If you’ve been at a single position for a long time, it’s possible that lately you haven’t had to discuss what you do. Spend some time creating an elevator speech about what you’ve done and what work you’re hoping to transition into. Craft a good answer to the prompt, “Tell me about yourself.” Learn the fundamentals of active listening, which can impact your performance in interviews. Having the ability to represent yourself well and demonstrate that you understand interpersonal dynamics is important in a competitive hiring climate. Does your workplace offer opportunities to learn new skills? Sometimes these can be technical skills, and sometimes they’re more “soft skills,” which are a bit more abstract but no less important. Investing your time in development opportunities will make you more marketable to outside employers, but consider the potential outcome at your current job. More skills mean more bargaining power, no matter where you are. If you’re considering staying at your current company, development opportunities might translate into promotion, more challenging responsibilities, and a better reputation overall. In either situation, it never hurts to have more training. Think strategically about how to get from Point A to Point B. Are you maximizing your opportunities to succeed? If you’re looking to change careers, are there any tasks or initiatives you can volunteer for at your current position that will eventually make you more marketable? It might seem counterintuitive to “lean in” more at a job you’re planning on transitioning away from, but in the long run this strategy might just tip the scales to make you a more favorable candidate in your job search. Employee Development Systems delivers results-oriented training programs that increase productivity, effectiveness, & performance. Contact us today to find out what we have done for other organizations and how we can help yours. Posted December 20th, 2016 by Marcia & filed under Conflict, Conflict Resolution, Corporate Culture, Leadership, Performance Management, Personal Effectiveness. As 2016 comes to a close, we consider some interesting business research from publications and firms around the world. Business research allows the industry to better understand human and employee behavior, develop programming that increases productivity and performance, and improve workplace culture. Likely trends in 2017. Business News Daily caught up with Glassdoor exec Andrew Chamberlain to ask about potential trends for 2017. His answers include increased data science in HR departments (such as the recent ROI report on our Increasing Personal Effectiveness program from one of our clients), more tech roles, and increased hiring. The “gig” economy and entrepreneurship. The 2016 Global Entrepreneurship Report published by Amway finds that millennials have a more favorable attitude toward entrepreneurship than do adults over 50. Struggling with workplace conflict? New research indicates that forgiveness as a part of conflict resolution results in improvements in health and productivity in the workplace. Office feedback: more is more. A study this year found that 65% of employees do not feel that they receive adequate feedback from their managers. This statistic suggests that investing some time and resources in feedback as part of management development is a wise move for employee retention and increased productivity. What business research did you find particularly interesting and relevant to your business operations this year? Posted December 15th, 2016 by Marcia & filed under Accountability, Actively Engaged Workers, Communication, Conflict, Conflict Resolution, Employee Development, increasing personal effectiveness, teamwork. Earlier this week we discussed soft skills and why employee development in these skills might be a good investment. Later this week, two articles reveal that focusing on productive communication, kindness, and “psychological safety” does, in fact, yield tangible results. This comes as no surprise to us, given the return on investment experienced by many clients who have purchased our programs on increasing personal effectiveness, assertive communication, leading with credibility, and more. But it’s encouraging to see what we know as the tried-and-true foundations of successful workplace culture echoed in independent research. Let’s take a look at what these studies have found! A recent article in Quartz investigates years of study by Google, who began an initiative called Project Aristotle to investigate what made their teams the most productive. They found that success has less to do with the right combination of different personalities on a team but more in how those personalities are able to communicate with each other. Google used the concept of psychological safety, “a model of teamwork in which members have a shared belief that it is safe to take risks and share a range of ideas without the fear of being humiliated.” This model is encouraged and fostered, of course, by effective communication practices and empathy for different points of view. Poor Communication Costs HOW MUCH? Again, we find that “spirals of incivility” are difficult to manage in the absence of empathy, understanding, and increased communication skills. Teaching employees, managers, and leadership about better ways to communicate with each other, foster respect and psychological safety, and recognize their own accountability is essential to creating productive teams. Measurable loss as a result of poor soft skills definitely indicates that employee development is a worthy investment. As we near the end of the year and you’re turning your sights on 2017, consider the changes your business needs to make. Will employee development be a part of your budget? How would better productivity, improved communication, and a more functional team help you to reach your goals in the new year? Posted December 13th, 2016 by Marcia & filed under Uncategorized. We call them “soft skills”: communication and interactional skills that demonstrate emotional intelligence. It’s been well established (for nearly a century, in fact) that “85% of job success comes from having well‐developed soft and people skills, and only 15% of job success comes from technical skills and knowledge” (source: National Soft Skills Association). Yet development of soft skills makes up only about 27% of money invested in employee training. If anything, these numbers show that the importance soft skills in developing a strong business culture may be severely underestimated. Of all the soft skills affecting business culture, the one that might be most foundational is a sense of empathy: being able to view a problem through the eyes of another. In the workplace, this can be empathy with a client, an employee, or a manager. Want to know how EDSI programs incorporate empathy, and how empathy development can translate to concrete gains for your company? Read on! One of the benefits of the Employee Development Systems courses is that they focus on understanding. 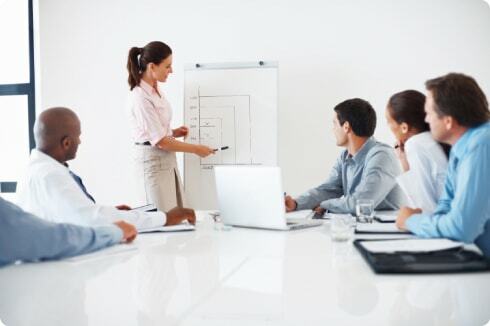 Beginning with the DiSC personality profile, these courses encourage participants to understand their unique personality and communication styles, and to learn more about the styles of their coworkers. Realizing how different people might have different approaches to problem solving, different conflict management styles, and different ways of interacting helps team members reach new levels of success, motivation, and productivity. Our products foster this understanding and then encourage active listening as a way to walk in someone else’s shoes. If empathy is employed by leadership at the top, it can funnel through the organization and translate to profitable changes. Employees who have taken Increasing Personal Effectiveness, which centers on soft skills such as communication, empathy, and personal accountability, report increased productivity and improved communication skills. Couple that with the work of sales teams, who will gain listening skills and learn how to better address the needs of potential clients. Empathy is also key in development phases, allowing leaders to listen about ways to make products stronger or more cost-effective. If you’re interested in training programs to increase productivity, performance, motivation, and effectiveness and to build a stronger business culture in your organization, consider how soft skills development might make a difference. Empathy and soft skills are not just abstract concepts! They improve a company’s business culture and lead to tangible results. Posted December 8th, 2016 by Marcia & filed under Actively Engaged Workers, Career Development, Employee Development, increasing personal effectiveness, Personal Effectiveness. Is your company looking for a new employee training program? Curious about investing in one for the first time? It’s wise to invest in employee training while things are going well rather than waiting for problems to arise. But employee development programs like Increasing Personal Effectiveness can help address issues like workplace dynamics, productivity, conflict, and management style at any stage. Here are five clear benefits to show why employee training is worth the investment. For businesses that struggle with meeting sales goals or other benchmarks, employee training programs may offer enough benefit to tip the scales. We develop programs that take a holistic approach, focusing on communication skills, personal accountability, behavior adjustment, and self-image as foundations for improved productivity and effectiveness. Employees learn effective habits from the inside out and feel empowered to use real-life skills. If the cost of employee training seems potentially prohibitive, know that these programs often achieve a high ROI. Employees leave development programs with skills to generate more revenue, improve interactions with clients, achieve goals, and resolve conflicts. See a report from one of our clients to learn more about their outcomes and to see details from their cost-benefit analysis! Employee training also has a demonstrably positive effect on employee morale. Investing in your teams with training offers the tangible benefits of better communication, increased empowerment and achievement, and better self-image. Improving workplace culture and reducing conflict makes employees not only more productive but also happier and better able to adapt to challenges. Employee development also shows the team that leaders care enough to invest in their individual success. But training isn’t only about individual success; it’s about a commitment to the company mission. A recent survey by EdenRed found that 68% of workers feel training and development is the most important workplace policy. After developing a higher morale, employees are better equipped to advance the goals of the business. They are able to see themselves as a vital part of the company, and thus their success is the company’s success (and vice versa). Development can be a crucial step in getting all team members on board. For companies interested in growth and recruitment, offering training and development is a selling point for potential employees. They see up front that the company will be committed to empowering and supporting them along their careers, providing the tools necessary for high achievement and promotion. The position becomes not only a job but also an opportunity for career advancement. Improved communications skills and a familiarity with training procedures also contribute to a better on-boarding experience. Posted December 5th, 2016 by Marcia & filed under Assessment, DISC Personality Styles. If you’re familiar with our programming, then you know that the DiSC assessment is an important part of what we do. Understanding our own personalities (and those of our team members, managers, and leaders) is essential to effective communication, conflict resolution, and improved performance. But what does the DiSC actually mean for the long-term success of a company? Does it have practical applications? How can it be put into play in day-to-day operations? The answer is that the DiSC isn’t just a test. It’s a roadmap for practical, productive relationships. Here are some concrete, tangible ways that the DiSC assessment can make a difference in your organization. The DiSC assessment motivates employees. Many of our clients have reported that the DiSC was a central feature of the most successful training initiatives they’ve used. A corporate training director from AFLAC says, “[Increasing Personal Effectiveness, which includes the DiSC] affords you the opportunity to learn your Behavior Style as well as others that you interact with on a consistent basis. We evaluate each course and I must tell you the results of IPE are impeccable. I am able to measure my return on investment with this product through positive feedback and persons continually asking me to offer it more often.” Providing employees with information about themselves, rather than lectures or documents lacking personalization, encourages buy-in from the very beginning. The DiSC is tailored to your specific goals. If you have a specific goal in mind, there is a tailored, specific DISC assessment that will help get you there faster. Different versions of the DISC target the area you wish to improve: the workplace, leadership, sales, management, etc. Questions focus on that specific context so that answers are more illuminating and accurate and so that programming is relevant. Programs built on the DiSC can have an immediate effect on performance. Many of our clients report, in addition to renewed motivation, an instant improvement in communication, effectiveness, and performance from training sessions centered on the DISC assessment. The director of training at Deutsche Bank, one of our clients, listed four immediate results he saw in employees: knowledge of personality types and the ability to adapt behavior and communication to each type, displaying more assertive communication skills (rather than passive or aggressive), applying active listening skills, and understanding each individual’s role in team development. We believe strongly in the DiSC because it fuels many of the programs we offer at Employee Development Systems. We have seen it help thousands of people, teams, and organizations to grow and improve with measurable results. Posted November 29th, 2016 by Marcia & filed under Accountability, Communicating To Manage Performance, Communication, Conflict, Conflict Resolution, Leadership. Conflict is a natural aspect of workplace dynamics, but it can quickly turn toxic if employees can’t find a way to work together. Managing difficult personalities in a way that is effective, compassionate, and respectful of differences is no easy task. Often, the source of ongoing discord isn’t a single situation but friction between personalities (either between peers or between a manager and her team). How can you help foster better behavior? There are many, many different types of personalities, and our programs are built upon the DiSC assessment. This allows team members to understand their own personality types and others they might come in contact with. This way, we can better identify organic preferences and tendencies but learn to separate them from behavior. Often, fear and disappointment can manifest as difficult behavior. One personality might need to be with people in order to solve problems, while another might need solitude and quiet to think. If those two people have trouble working together, one or both of them might come across as difficult. The extrovert might seem loud and domineering, while the introvert might seem passive-aggressive and sullen. In another scenario, one personality might need independence and creativity to produce good work, while another requires more structure. If an employee is exhibiting difficult behavior, first try to understand what anxieties and needs are driving it. What’s actually going on? The workplace is no place for an elephant in the room. Management should develop a culture where free and open (yet respectful) communication is encouraged. If this culture exists, then it should be very easy to address conflict head-on. In private, ask about how things have been going for them and listen closely to the answer. Then address the behaviors, providing examples yet being careful not to frame those behaviors as part of the employee’s personality. “You’re overbearing” is a great way to fuel even more conflict; instead, use “I” statements to note what you’ve observed: “I notice that other people in the staff meeting don’t get to finish their contributions before you pitch in.” Finally, clearly state what behaviors need to change but also ask how you might be able to help them meet these benchmarks. While this isn’t a one-size-fits-all approach, sometimes difficult behaviors can actually be converted to company assets. That person who constantly criticizes new ideas might benefit from some behavior counseling, but can also serve as a keen devil’s advocate on a team exploring new possibilities. (Setting and successfully meeting benchmarks along the way can also silence negative voices.) Setting team-based rewards for people who seem self-absorbed and competitive can motivate them to work better together with their peers. Overall, managing difficult personalities can be a struggle, but in many cases it’s still possible. Confront issues with compassion and respect, putting employees in opportunities to minimize embarrassment or resentment about your counseling, yet remaining firm. Maintain documentation, express clear standards for behavior, and make accountability plans for achievement. You may not be able to make people change, but you can provide a clear and motivating roadmap for your employees to do so. Posted November 23rd, 2016 by Marcia & filed under increasing personal effectiveness. Is your company interested in employee development, but not sure about each program’s cost-effectiveness and ROI? You may be concerned about the investment of funds and time away from day-to-day operations. You may wonder if a course like Increasing Personal Effectiveness will truly pay off. Will you see results in terms of employee satisfaction and attitude, improved productivity, and eventual cost savings to your business? The Career Management Center at the Children’s Hospital of Philadelphia recently performed a study of their return on investment for Increasing Personal Effectiveness. Participants who completed all three sessions of the Increasing Personal Effectiveness program were surveyed and asked to report their overall percentage improvements. We’ve love to share with you what they found. Gain access to the FREE results of this case study to see if the Increasing Personal Effectiveness program improved employee performance and productivity for hospital employees and resulted in cost savings for the organization. Posted November 22nd, 2016 by Marcia & filed under Change Management, Corporate Culture, Leadership, teamwork. In our “Adapting to Change” blog series, we’ve discussed all the important steps to bringing fundamental shifts to your organization. We’ve highlighted the importance of recognizing when there is a need for change, communicating the need for change and inspiring employees, maintaining momentum, and setting attainable benchmarks to induce progress. To close out our series, it’s time to commit to permanent transformation. How can we make changes last for good? It’s easy to slip back into old institutional habits, particularly when changing behaviors takes a lot of work. In the end, though, it’s crucial to stay consistent. It’s not just the behaviors that need to change, after all: it’s the entire company culture. Don’t let the systems and policies that have worked well to usher in change go stagnant. Did encouraging creativity result in better ideas and a team that felt valued for their contributions? Make changes last by setting aside a few days per month or per quarter for problem solving sessions. Did setting attainable benchmarks work to motivate staff? Keep them going, even after measurable goals have been met. (You can always set more!) And don’t let your communication with your team suffer! It took tremendous effort on your part–and trust on theirs–to get to this point. Letting your hard-fought changes slide back to the beginning, even if the initial problem has been met, can drastically harm the morale of your company. Not only does it create the same culture that allowed the problem to develop or fester in the first place, but it shows your team that their efforts and ideas don’t ultimately matter. Putting systems in place to keep energy moving in the right direction should be a very high priority for continued success. Perhaps the only guarantee in the lifespan of your company is this: problems are bound to arise. The problem that fueled this adaptation in your business is likely not the first, and certainly won’t be the last. Having the necessary tools to adapt to change and to healthily respond to challenges at all levels is key to success. If your team knows that it can respond effectively to challenges, then teamwork and goal-setting and communication become easier the more they’re practiced–a crucial response when the next problem comes along. A team that can make changes last is healthy: they possess commitment to effectiveness and performance, they value and trust in one another, and they can adapt to a variety of situations. This step might be one of the more challenging aspects of adapting to change, but in the end it’s also likely the most important. Posted November 17th, 2016 by Marcia & filed under Communication, DISC Personality Styles, Personal Effectiveness. A recent study in the Journal of Personality and Social Psychology found that only 13 percent of people are completely satisfied with their personality types. That number seems pretty low, but many of us likely have at least one element of our personalities that we wish we could change — becoming more outgoing and extroverted, or being a better listener, or not feeling like so much of a perfectionist all the time. But once you learn your type through an assessment, can you change your personality type if you’re not happy with the results? The jury is still out on this question of whether or not you can change your personality type, but let’s take a look at what you likely can control and what you probably can’t. Your personality type, if it’s determined correctly, is probably yours for life. Particularly in adults, who have settled into their personal preferences and uniquely firing synapses, it’s difficult, if not impossible, to change the most fundamental parts of who you are. If you’re an introvert and you find large crowds of people draining, you probably can’t suddenly decide to find them energizing instead. While you may feel discouraged by not being the personality type you wish you were, take heart. You are more than just a label, and each personality type has its own strengths and challenges. Every personality “weakness” likely has a coordinating strength. Being dominant also goes hand-in-hand with confidence and big goals. Indecisiveness corresponds with being careful and deliberate. There really are no “bad” personalities on paper, just bad behaviors. Fortunately, personality doesn’t dictate your decisions or your behaviors. Or at least it doesn’t have to. The same psychology study found that people who forced themselves to engage in more extroverted behaviors ended up describing themselves in more “extroverted” ways. If in your DISC assessment you’re an S personality (motivated by cooperation and teamwork), you’re not likely to change to a D type (motivated by competition). But with a lot of effort, you might be able to alter how pronounced the Steadiness trait appears relevant to others. And it’s helpful to know where your strengths and weaknesses lie so that you can use them better. Knowing that you’re an “ideas” person but that you might be challenged by dropping the ball in the details will give you some practical goals to work on: setting benchmarks for completion of small tasks, for example. Many of our programs focus on using each team member’s personality type so that they can understand themselves, understand how to communicate more effectively with each other, and how to shape their responses to increase personal effectiveness. A personality type isn’t the end of the assessment, but the beginning of a journey of self-discovery and self-improvement. We deliver results-oriented training programs that increase productivity, effectiveness, & performance.